Shoulder slope and shoulder angle are two entirely different things when discussing equine conformation, yet many times the terms are used incorrectly or interchangeably. Shoulder slope references the slope at which the scapula sits in direct relation to the horizon, while shoulder angle is the angle created at the joining of the scapula and humerus bones. Shoulder slope: is marked from highest point of wither to point of shoulder and then measured against the horizon. The slope of the horse’s shoulder ranges between 40-60 degrees. A slope of 45 degrees is considered ‘laid back’ and is ideal for Dressage horses. A slope of 55 degrees is considered ‘straight or upright’ and is more useful in jumping or gaited horses for lifting the knee. A shoulder slope of 50 degrees is what I call ‘utility or all-around’. At the outer limits of range we have 40 and 60. 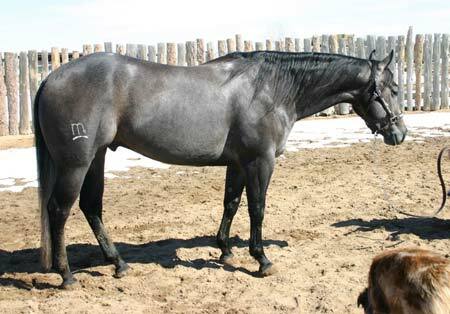 A horse possessing a shoulder excessively laid back is still quite functional and not necessarily prone to lameness, but a horse designed like this will give their owner a headache when it comes to saddle fit. The scapula will lay back so much that it’s next to impossible for a saddle to be done up when it’s sitting in the correct position on the horse’s back. Placing it so it can be done up with the girth not around the horse’s belly puts it over the scapula. As we know, a saddle in this position would block the ability of the scapula to move freely thusly also blocking movement of the horse’s entire front leg. Even a cutback saddle won’t always fit this conformation. The only horses I’ve ever seen carry this kind of conformation are some Friesians and some Drafts. Note that for carriage or Draft horses, that a laid back shoulder is desired to more readily fit a collar. At the other end of the range, the very upright 60 degree shoulder also does not create unsoundness, in and of itself. Nor does it create a short, choppy stride as is often thought, though, a feeling of less elasticity can certainly be an outcome. What it does do is create added concussive stress through the entire forelimb, which in turn can cause unsoundness. Neither ends of the spectrum are desirable in a horse and should be avoided on principle alone, that principle being what’s best for horses and allowing them to perform their jobs without undue risk to longevity. Shoulder angle: is marked by adding a second line to the shoulder slope line from point of shoulder to point of elbow. The subsequent angle created between the two lines is then measured. The angle created at the joint can range from 80-115 degrees. 90 degrees is the magic number here; anything less and the horse will be short-strided in the forelimb. No other combination of traits can make up for that short-stridedness, or nullify an angle below 90 degrees. In many cases it should be a deal breaker. Anything over and above 90 degrees is a bonus. Many of the GP jumpers who are able to bring their knees to their ears possess an angle at the higher limit of the range. Let’s look at our random sampling of horses and see how they measure up. 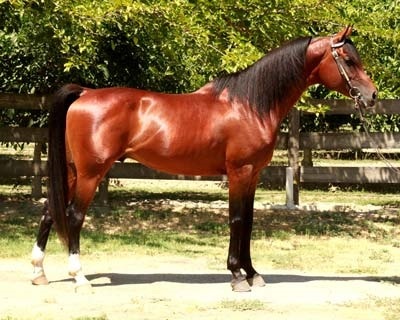 Our stallion carries a typical lovely shoulder slope of 50 degrees. It’s the kind of trait that fits a versatile breed. Not surprisingly, though, he also carries a shoulder angle of less than 90 degrees – about 85. This latter is unfortunately a trait that is quite prevalent in the QH breed. This horse’s shoulder slope is approximately 48 degrees, unfortunately he too has a closed shoulder angle and more so than our first horse. It measures about 78 degrees. However, this is not really his actually shoulder angle, which is closer to the same 85 as our first horse. 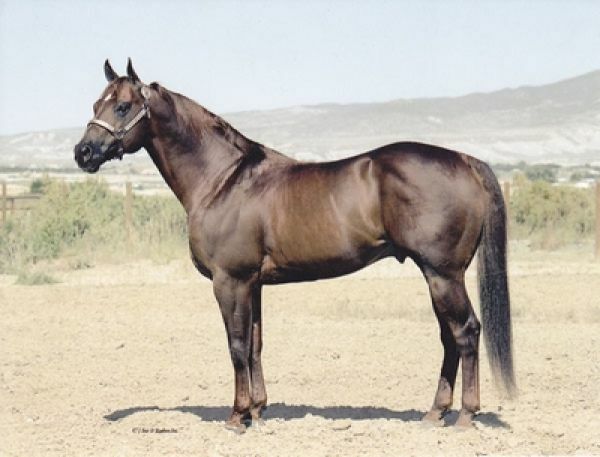 Note that this horse stands with his shoulder angle artificially closed by standing ‘over’ his point of shoulder with his forelimbs too far under his body – leaning forward. If he stood how he should, his shoulder angle would open a bit, but still be less than 90 degrees. Here we have our first upright shoulder at 55 degrees. What surprised me was that it’s combined with an open 95 degree shoulder angle. This combination is unusual in QH’s, more often seen in TB’s. I wonder if this guy isn’t expressing some TB influence in his pedigree. Another lovely all-around shoulder slope of 50 degrees, but to my surprise his shoulder angle is also closed at 85 degrees. This is highly unusual for an Arabian, such that I actually went back a few times to recheck the points and numbers. The lighting in the photo, which perfectly highlights his bones, confirms the results. If we account for the right front leg being, perhaps, a bit too far underneath then we can add a degree or two, but it still puts the angle short of adequate. But then I had to consider the clubbed foot, which with its too high heel is going to artificially close the shoulder angle by lifting the elbow (note it also slightly buckles the horse’s knee putting him over at the knee on that leg). I would bet some of my own money that if we had a photo from this horse’s other side, that the shoulder angle would measure the desired 90 degrees. As expected, our TB has a more upright shoulder at approximately 54 degrees. The angle is ever so slightly closed at 89 degrees, but note the left front leg is a bit too far underneath the body and so our TB actually possesses an adequate shoulder angle of 90 degrees (and possibly even a touch more). 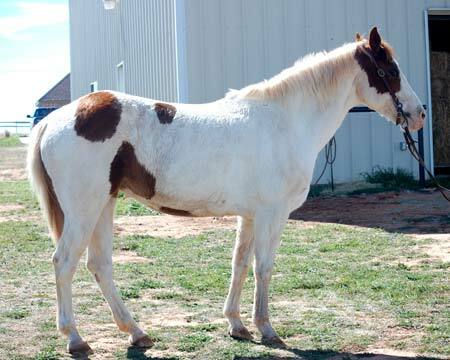 Our paint mare has the most upright shoulder of the lot at approximately 57 degrees and an adequate angle of 90 degrees. In part two I’ll discuss the signficant importance of the humerus bone and its direct relation to the scapula. This entry was tagged conformation, shoulder angle, shoulder slope. Bookmark the permalink. If I remember correctly, Dr Deb had a conformation article in Equis, a year or so ago, and she mentions that it is not always correct to use the highest point of the wither to determine scapular slope as the scapula is independent of the wither. I believe she prefers to use the scapular ridge for a more accurate gauge of slope. I’m sure you are already aware of this and are using the wither because it’s easier for most people to pin point, but thought I’d mention it anyway. But yes, she will occasionally say slightly different things depending on the circumstances. None of us, least of all those learning, can see the scapular ridge on candidate horses 2, 5 or 6. Horses 1 & 3 are more visible, but due to large masses of flesh one has to know that under those highlighted points in the photo lies the ridge. Only horse #4 is clearly seen. Certainly because the scapula is independent of the wither and all sorts of funky foot, limb and soft tissue issues can place the scapula out of its correct alignment (as the Horse Gods intended) with the highest point of wither…..you get the idea. Thusly for the sake of not complicating things for people, I chose to stick to her statement from her book. I remember when I read that article about shoulder slope, it just struck me because the highest point of wither is what I had always heard, but she went into pretty great detail about it. It was especially evident on a QH example she used with a very straight shoulder. The scapula ends quite a bit in front of the wither. I’ll go try to find the magazine issue just in case anyone is interested. Shoulder Form and Function is the article for anyone interested. Awesome, thanks for the reference source. I need to make a correction… The article I was referring to regarding point of shoulder/point of wither is actually in the June 2012, Equus, Issue 417 (An Eye for a Good Shoulder) . After rereading April’s article, I realized it wasn’t the one I was thinking of. Both are great articles on shoulders, though. June’s article shows how to “see” a shoulder, while April’s discusses the various angles and lengths of both the scapula and humerus and how that effects movement. This is why she needs to finish her new book on conformation, so everything she explains get put in one place again. She is having one of her anatomy classes again this fall for the truly dedicated who want to dissect a horse with her and see how things really work with the muscles and the bones all in place and living color. I kind of like the antiseptic aspect of drawings myself. Like dissect, dissect? As in Grade 12 biology dissecting a frog, dissect? Cool, but also…um…not sure I could witness that. Yes, as in real bodies with the bones and muscles and ligaments, so you can see the muscles, and then see how a ligament or muscle moves the bones. In other words, all those things that we can’t see, mostly can’t qute fathom from words without significant time and effort. Since I haven’t conquered by squeamishniss to go, I think that hide and organs are already largely removed, but there are feet to cross section, all sorts of things. Where is she doing it? You should go. Turlock, California, you should go, you know how I am about airplanes, the very idea of airports, crowds of people, exrays that see through my clothes, makes me nervous. I’m so with you on that! I’d drive first. Can you put up the skeletal horse again with this post? If you insist…let me see if I can figure out the html code to do it properly. There’s always someone in the room jumping ahead. Who puts down a book when the story is good??? Someone want to sponsor me? I’d totally go! LOL! Cool. With each one of these posts I always compare to the photo of my horse that I have on my computer (fortunately, no workers have caught me with my ruler up the computer screen yet to ask what I’m doing). Too bad I don’t keep a protractor at work to measure angles. My eyeballing says that my horse has a somewhat upright shoulder, but a very open angle. She does have a knees-to-her-nose jumping style, so I guess that would be the why/how. Not a one with 90 degrees! Is there a time that a horse can have a shoulder that is too open? A judge in a confo clinic, Practical Horseman, faulted a horse for 92 degrees. Other than folding for jumping, what could be the downfall of this. There was no elaboration. No, a horse can not have a too open shoulder angle. There is no fault associated with it. The greater the angle, the more range of motion the joint possesses. I would have to say that the judge was a doorknob. Even if the judge faulted the horse at 92 degrees because they didn’t consider it an open enough angle, the judge was a doorknob. As the next installment will explain, there’s more going on in the front leg than that angle. The cutoff is 90 degrees…less than that and the horse lacks range of motion in that joint and it will result in a shortened stride and an inability to bring the knees up well no matter what else the horse possesses. But, at 90 degrees (or 92) if a couple other traits are present, then the potential for knees up exists. This is a good time to remind people that there are some traits (like LS joint placement) that matter on their own, meaning nothing else the horse possesses can make them better, nullify them etc… Shoulder angle is another of those traits. If it’s closed, that’s bad all day long, every day, unless you like riding a short-strided horse…and some do, just look in the WP ring. *eg* But it’s still a fault in the horse. Mostly the horse is the sum of its part and the difference in individual traits is about tradeoffs. “I’d prefer a bit more slope to the shoulder as the shoulder angle (junction of the scapula/humerus) is greater than ideal” (92 degrees illustrated) I’d also like to add that the front leg being critiqued is at least a foot behind the other fore as if the horse is going to take a step. 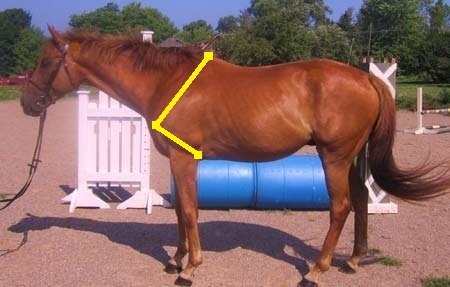 So the shoulder slope and angle would actually be greater if the horse was standing correctly? This is from the June issue by a USEF, Canadian judge on TB’s as sporthorses. I agree with her placings but no reference to the leg position affecting shoulder angle of any of the horses and none are square. to me, it makes little sense to evaluate the angle of a leg in motion, think about the joint’s function, it is to open and close in a scissor action to enable the lower bones of the leg to move. So if the leg is moving, then that joint and its angle is changing with the motion. A standing horse with the leg squarely under him, has a resting angle that tells us something about the range of motion of the foreleg, it is predictive. Once the horse moves, the angle will open as the leg comes forward that is necessary for the leg to move foreward. 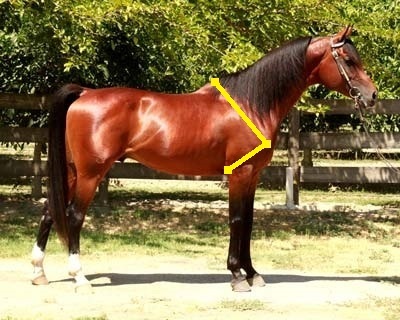 So if the horse in the picture you are looking at has brought the leg forward, then the angle should be more open than the resting angle and exceed the ‘ideal’ resting angle. And the ideal is in part ideal for a use, quickness in a cowhorse doesn’t require the same structure as high stepping showy gaits, and of course, bone lengths, which we haven’t gotten to, but Blondemare is jumping ahead again, affect quickness as well. A sweepy hunter stride isn’t a saddleseat stride. Part is training, but as always, it helps to start with conformation that lends itself to the style you want. The judge is also mixing apples and orange, slope of shoulder is set without regard to the openess of the scapula humerous angle. If the judge doesn’t like the slope, that isn’t a problem of the angle of the s/h joint. She is commenting on the somewhat straighter shoulder than she likes. A greater slope in the shoulder does not guarantee a closed angle in the h/s joint. 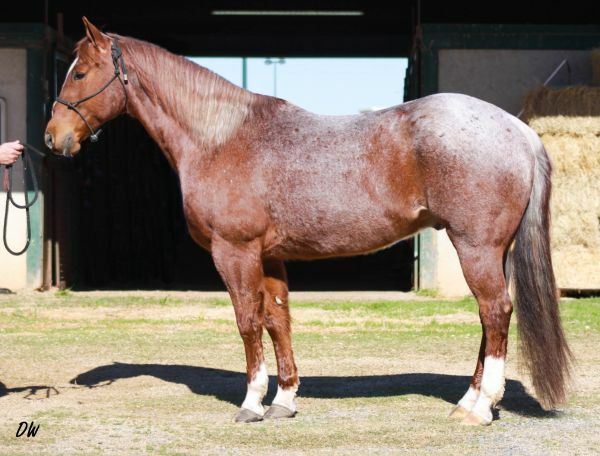 A draft horse bred to plow may have a lot of slope to the shoulder, but not much openess of the angle of the s/h because it doesn’t need a high stepping gait, but a steady slow gait of limited stride length. 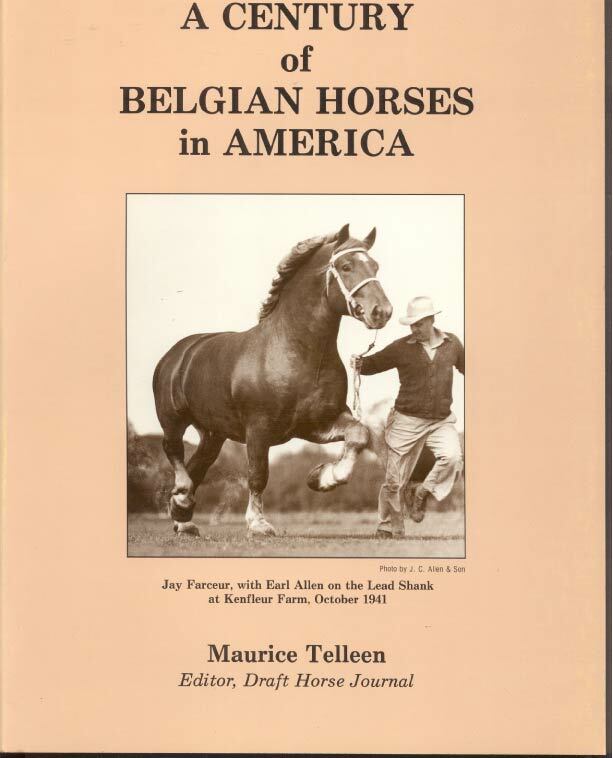 As hitch horses for show became more popular, the belgian was bred to be taller (real work horses, generally around 15.2 -16 hands, more body than leg height) which shows in this horse, but notice the high knee action. 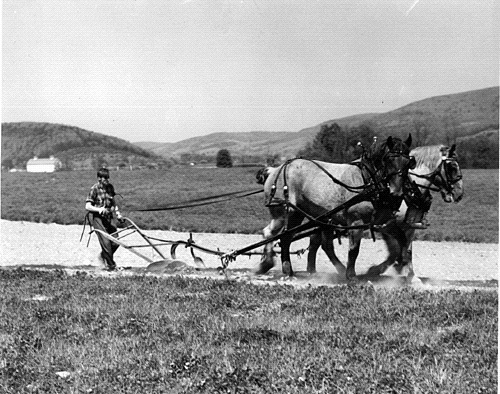 Now in the field, a work horse needs to be able to negotiate obstacles, and pick up its feet, but it would not last plowing 8-12 hours a day if that was its primary way of moving. Not jumping ahead this time, my comment is relative to Merc’s explanation of the roan gelding having a leg farther under than ideal to calculate s/h angle. If this is the case, then the judge critiquing these TB’s is incorrect in her angles as the horse she states has a greater than ideal s/h angle, has the foreleg on the same side as the s/h measurement, behind the other fore by at least a foot, thereby affecting the angle and slope. This horse looks to be in the 50-55 degree range on slope but if he were to put his foot forward, square under his body, that slope would change to a more lower angle, more sloping and less upright. Therefore, I want to confirm that I understand Merc correctly where the horse should always be standing square prior to assessing shoulders. The horse is not in motion but appears that he is about to step forward. The top of the scapula moves back and down, thusly decreasing its slope, in turn the lower limb moves forward, knee up, blah, blah, blah. So, if the horse is standing with the forelimb exaggerated forward in stance the scapula will be engaged (relative) and not at its exact resting slope. As well the shoulder angle will be artificially open and also not at its exact resting angle. But remember, we are not using the scapula itself to measure its slope, we’ve merely drawn a line from point of shoulder to highest point of wither (scapula free floats over the ribcage). If we were using the scapular ridge to measure slope, then the horse not standing square would affect our slope measurement, but since we aren’t it doesn’t matter. 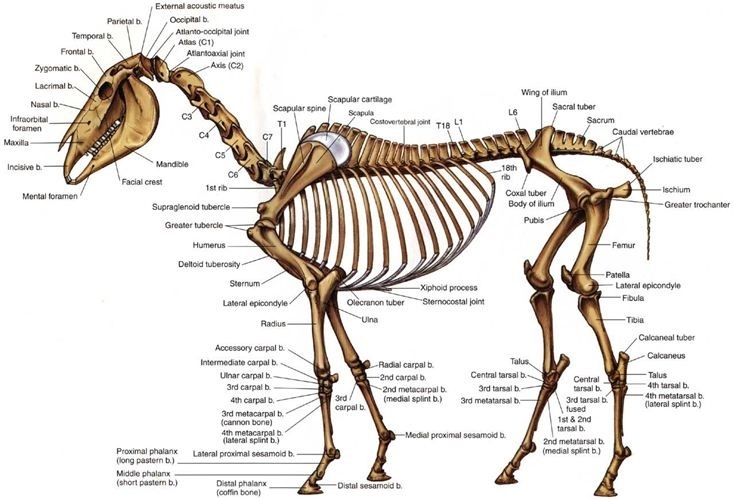 We are, however, using the humerus bone itself as part of the the shoulder angle, and since that bone’s orientation is changed when the horse isn’t standing square, then we must consider how the horse’s stance affects the measurement of the shoulder angle. This is a prime example of why conformation is always preferred to be judged with the horse standing on level, firm ground and square. Our roan horse is not standing square in front…there’s a reason for that that I have not yet talked about, but because he is not square his resting shoulder angle can not be accurately measured, we can only imagine the leg properly placed and guess how much that changes his angle. And since we can’t see his scauplar ridge, anyway, it does not matter if his scapula is not quite sitting in its exact resting position since we aren’t using the scapula specifically to measure its slope. Lastly, there is quite a difference between 50 and 55 degree shoulder slope, so much so that once you look at enough horses you can pretty much tell at a quick glance if a horse is sporting a slope of 50 or 55. The second place horse is described as having a ‘shoulder angle looks average…’ and he represented with a 90. His foreleg is also behind square up and down. No comment at all on the 3rd placed horse with 86 degrees as her shoulder angle and she’s also a full step behind on the near fore. I don’t have an eye to gauge a true angle when the leg is behind square and how much will change when stood correctly. I can see straight or sloped, it ends around there without a protractor! A protractor is your friend (and a ruler) until you develop your eye. Hi, I know this thread was posted awhile ago, but the information was so helpful! I have a question about a draft cross that I’m looking at buying. He is a friesian draft that I’m wanting to do foxhunting, dressage, and some driving with. I will do jumping too, but nothing over 3 foot. He its 16.1hh and only 3 years old. Can I send you a photo of him and ask your opinion? Thanks! Mercedes, could I have your email address so I can send you a photo of a horse I am looking at? This is one of the best threads about conformation that I have found! Thank you!